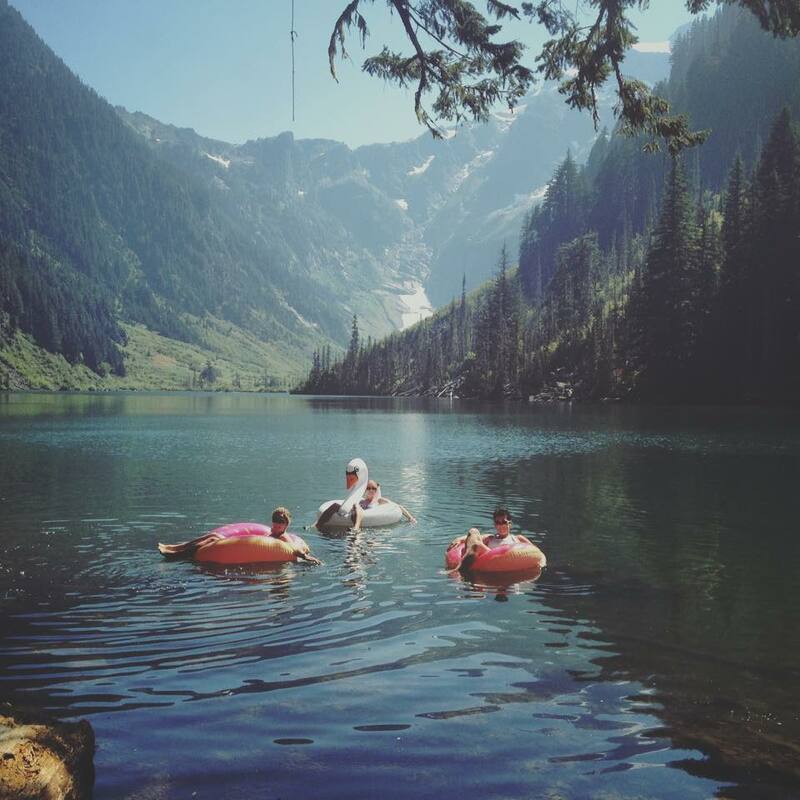 When we hiked Goat Lake last year, we all agreed that we definitely must come back and that we’d be bringing floaties and staying awhile next time. This last weekend, our floating day happened and it was everything I expected it to be and more! The entire trail is gorgeous, well maintained and even though it was a hot day, we stayed relatively cool as we walked the thick forest path, that winds along a rushing creek. 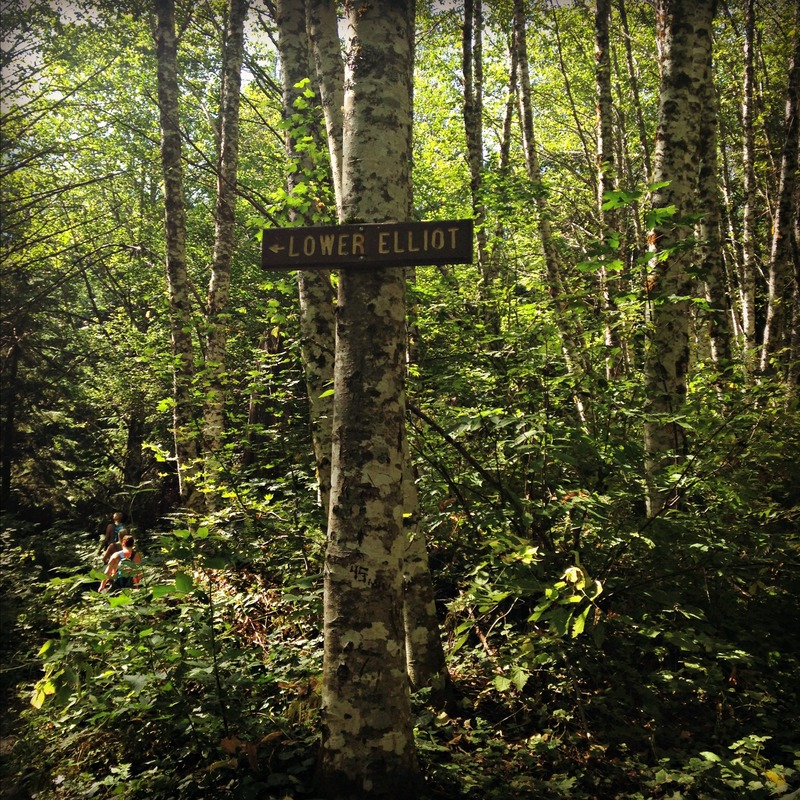 When you do this hike, I’d suggest taking the LOWER Elliott Creek trail both ways. It’s a great trail and I can’t imagine the upper one being any better. 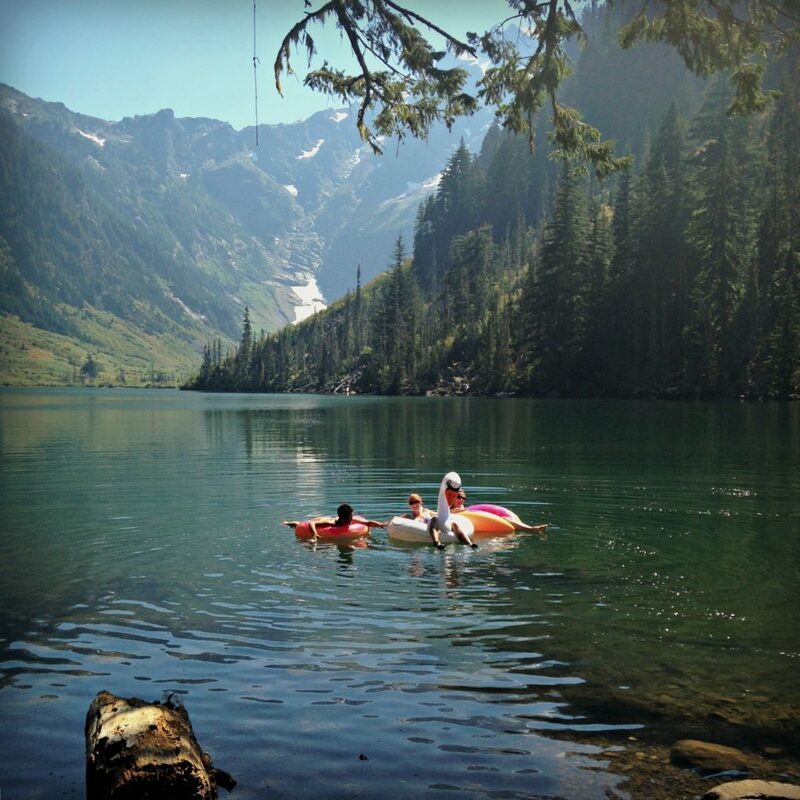 Because this hike is long, you’ll want to take lots of water with you, high protein snacks and hey—-you should probably float the lake while you’re at it, so you better bring your largest backpack for all your gear. At 10.4 miles with 1,400 elevation gain, this hike is on the longer side, but not too incredibly steep. 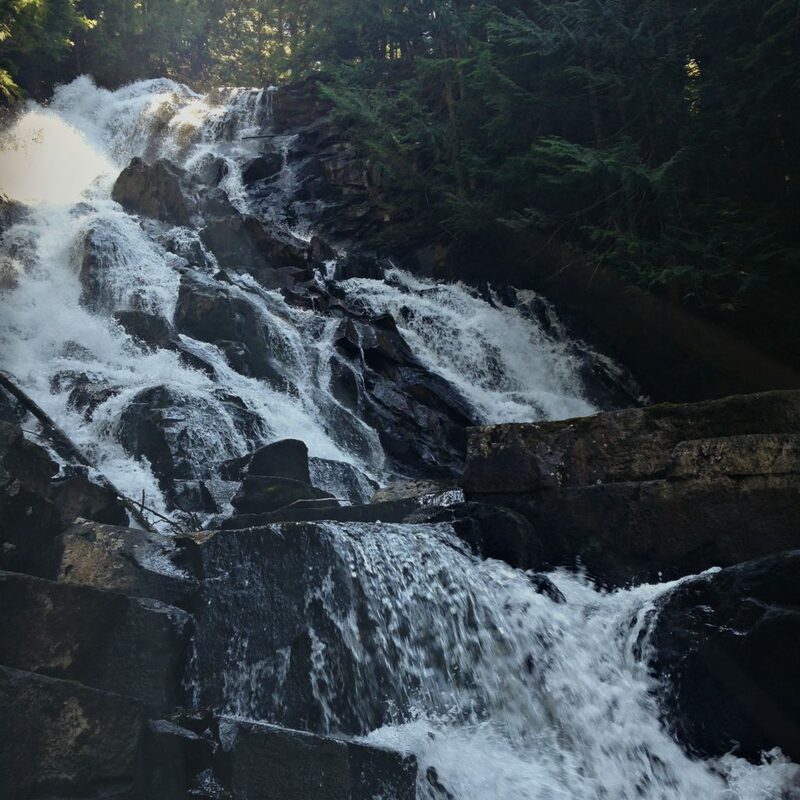 As you almost reach the end of your hike, you’ll notice some incredibly large waterfalls off to the right. You might be tired and unsure if it’s worth going over to check them out. Go. Trust me. Photos do not do the waterfalls justice! Hiking to the lake took us about 2 1/2 hours. Once arriving, we blew up our floaties, ate lunch, took off our hiking clothes and hid behind trees to put on our suites. For the next few hours, I felt like I was 10 again. Out there with my friends, I couldn’t get over how thankful I am for this life. I get to Mother, hike, be with friends and still do adventurous things and giggle like a kid, after having 3 babies of my own. With the way the weather has been lately, I’d guess that we have quite a few summer days left. Grab your friends, get some floaties and go! Tons of water and snacks! Sunscreen. 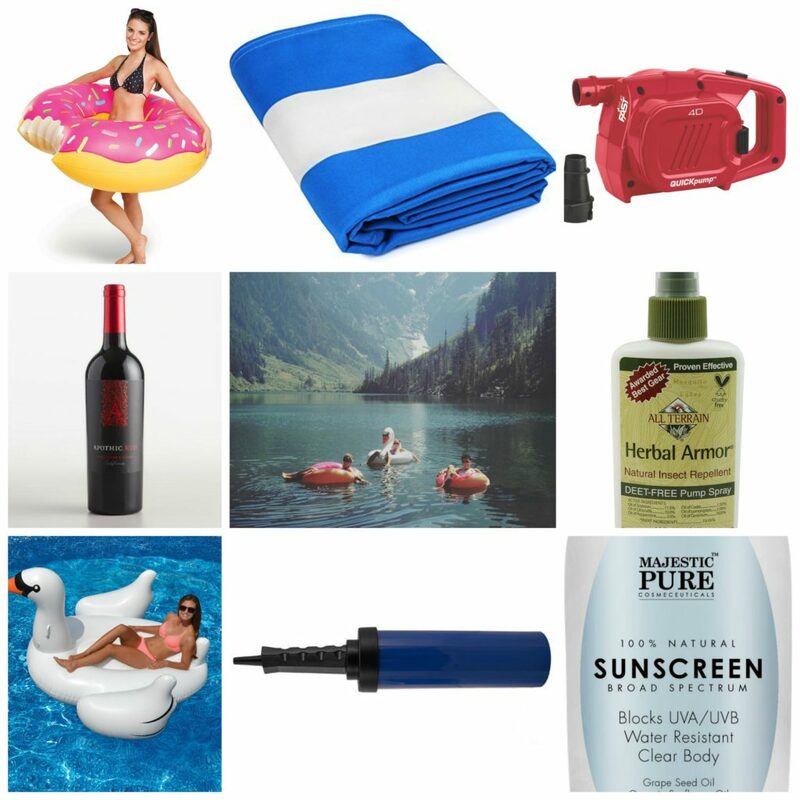 You won’t really need it during the hike, but once you reach the lake, you’ll be in full sun if it’s a day. Bug spray. Bugs are the only negative about this hike. A few gals in our group got stung by bees on the trail and while we hiked, the mosquitoes were annoying. Out on the lake however, there wasn’t a single mosquito! A hand pump or even better, a battery operated bump like the Coleman one pictured above. 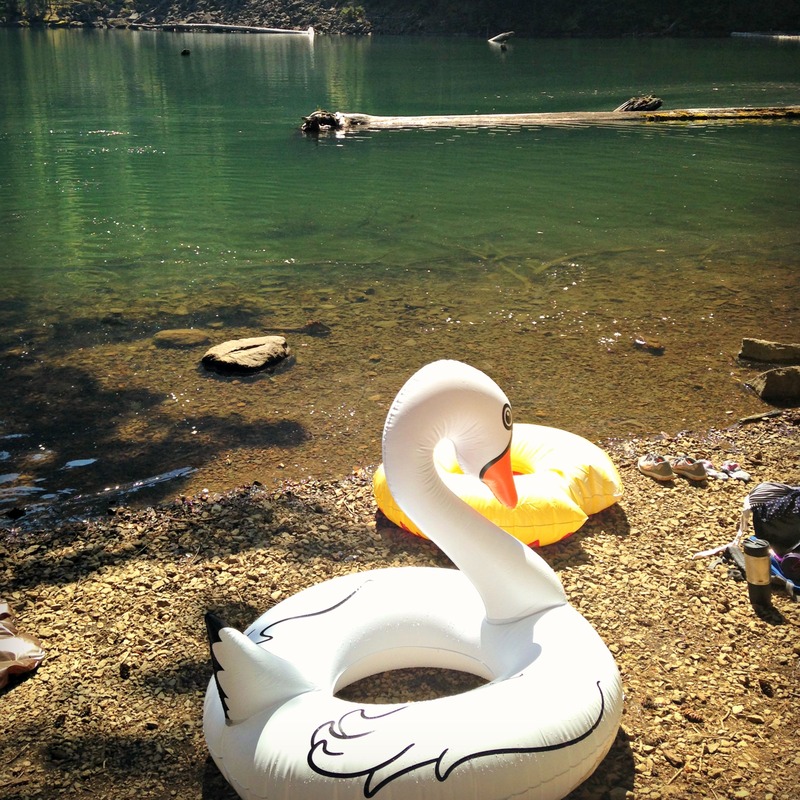 After hiking 5.5 miles, the last thing you’ll want to do is sit there and blow up your floaty. Your swimsuit. I wore mine under my hiking clothes and then changed out of it afterwards. Do what works for you! A big plastic bag for your wet stuff. This way when you pack up, your wet stuff won’t get the inside of your backpack wet. Happy Floating! Be sure to share your photos to #nwhealthymama! Can’t wait to feature you on our Instagram page! Looks awesome! Can dogs come on this hike/swim in this lake?